Combine mustard, parsley, honey, vinegar, water and hot pepper sauce. Place steak and onions on grill over medium coals; brush both sides liberally with glaze. Grill the steak until cooked to desired doneness, 4 to 6 minutes per side for medium-rare. Grill onion until tender and translucent. Transfer steak to a cutting board and let rest for 5 minutes. Slice the steak thinly across the grain and divide between four plates. 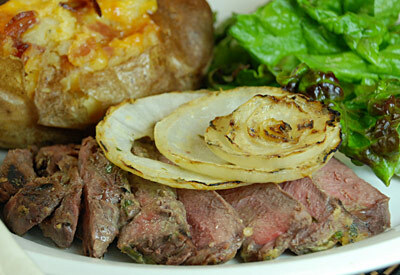 Top steak with grilled onions.